Need a big assist? Need clutch defensive work? Need a playoff hero? Look no further than Tyler Johnson, who did all that and much more in Tampa Bay’s 3-2 overtime win over Detroit in Game 4 of their Eastern Conference series. Down 2-0 in the third period on Thursday night, Johnson got the Lightning on the board and then assisted on the game-tying marker. The centreman wasn’t quite done yet. Just 2:25 into the extra frame, Johnson supplied the heroics, giving the Lightning the win with his fourth goal of the post-season. The series is now tied at 2 games apiece as the scene shifts back to Tampa. STAT PACK: Aside from his three-point night, Johnson had a plus-three rating in 19:46 of ice time and 29 shifts. NEED TO KNOW: In spite of a brilliant Western Hockey League career with his hometown Spokane Chiefs, including a 53-goal campaign, Johnson went undrafted. 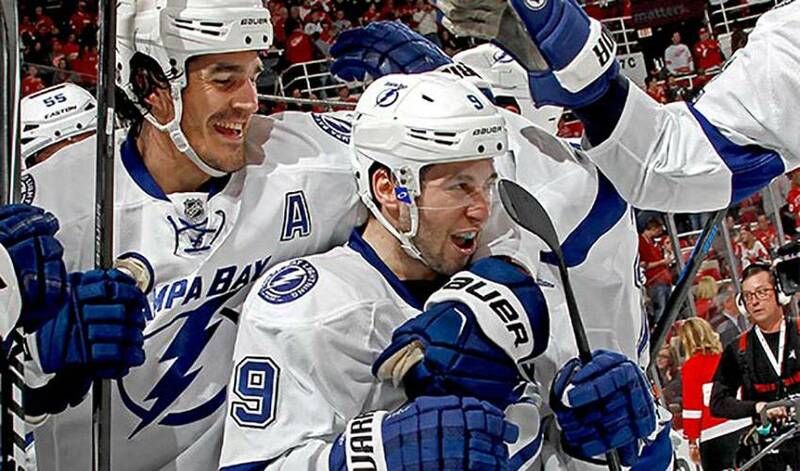 Lightning struck when he signed an entry-level contract with Tampa Bay in March of 2011. GOING STREAKING: In 2011-2012, as a member of the Norfolk Admirals of the American Hockey League, Johnson went on a 13-game scoring streak, including consecutive two goal games, the longest streak by an AHL rookie in more than six years. It earned him AHL Player of the Month honours for March of 2012. AND THE AWARDS GO TO…: Tyler was selected as the Best Overage Player, Top Defensive Forward, Best Skater, and Top Faceoff Man, finished second in Most Valuable to Team, and third in Most Accurate Shot in the Best of the West (WHL) 2011 poll. AMERICAN DREAM: Johnson has made his mark on the international stage, helping lead the United States to a gold medal at the 2010 World Junior Championships, registering three goals, five points and a plus-4 rating in seven games. A REAL PLUS: Johnson, in his second full NHL regular season, fashioned a plus-33 rating in 77 games, good enough for the third-highest plus-minus total in 2014-15. His 72 points put him 14th overall in the category. HONOURABLE MENTIONS: Filip Forsberg (3G) came up huge as Nashville staved off elimination with a convincing 5-2 win over Chicago. Evgeny Kuznetsov (2G, 1A) was a force for the Washington Capitals in their 5-1 win over the New York Islanders. Ryan Miller (20 saves) helped Vancouver extend their series against Calgary in a 2-1 Canucks win.